Paul Cook insists he has not closed the door on James Dunne, Johnny Ertl and Andy Barcham. However, the trio’s Pompey futures remain uncertain following their absence from the pre-season trip to Portugal. The three remained at home when the Blues jetted out to Vale do Lobo on Friday for a six-day bonding trip. Also left behind were first-year professionals Brandon Haunstrup, Chad Field and Snorre Nilsen, although Tom Craddock and the recovering Jack Whatmough were included in the tour party. 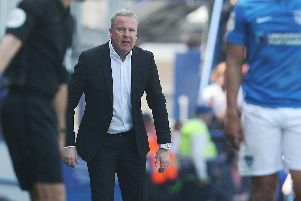 Yet it is the situations of Dunne, Ertl and Barcham which is a talking point among the Fratton faithful as Cook continues the major surgery to his squad. Ertl is presently in talks with the club over a settlement, while Barcham has been the subject of interest from AFC Wimbledon. As for Dunne, his partner is currently pregnant with their first child, although question marks also exist over whether he will remain on the south coast. Cook, however, is adamant their Fratton Park time is not over. He said: ‘At the minute there are different things going on at the club and we must be respectful to the players. ‘Certainly by the time we get back there might be a change or two. ‘Dunne’s particular reason is his missus is pregnant, so that was a logical one that he wanted to be at home just in case she had the baby. He wouldn’t have settled out here as well. ‘With him we are also looking at the travelling involved (to the club) coming from London and they are little things. ‘Barchy is one that could possibly be looking to go elsewhere. ‘If he decides not to go elsewhere then he would be welcomed back into the squad. ‘We have had on-going talks with Johnny Ertl and I am sure there will be stuff to announce maybe when we get back. ‘He certainly has been a massive player for this club and should be treated with the utmost respect. Ertl has a year remaining on his contract. Barcham also has 12 months left on his deal. And Dunne has one year remaining, plus a 12-month option. Cook added: ‘There are going to be changes and if that doesn’t happen with any particular player, he will always be welcomed back into the squad. ‘At Chesterfield I put Sam Hird on the transfer list because it was felt it wasn’t going to work out – and he then ended up being one of the best players in my team by a mile. ‘I will always do what I think is beneficial for both parties, the long game being the bigger plan.